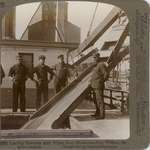 "9465 Harbor of Fort William -- Steamer Huronic leaving for Detroit -- Ontario Canada" "Copyright 1906 by H. C. White Co." "The "PERFEC" Stereograph. (Trade Mark) "Patented April 14, 1903. Other Patents Pending." "H. C. White Co. Gen'l Offices N. Bennington, Vt., U.S.A." "Branch Offices: New York, Chicago, London"
"9466 Unloading coal -- a modern lake steamer at Fort William, Ontario Canada" "Copyright 1906 by H. C. White Co." "The "PERFEC" Stereograph. (Trade Mark) "Patented April 14, 1903. Other Patents Pending." "H. C. White Co. Gen'l Offices N. Bennington, Vt., U.S.A." "Branch Offices: New York, Chicago, London"